November: Date/s will be confirmed in September. $50 per person ($40 for NZMS members) – numbers limited to 6 participants per Workshop. Book early and pre-pay registration to ensure acceptance. 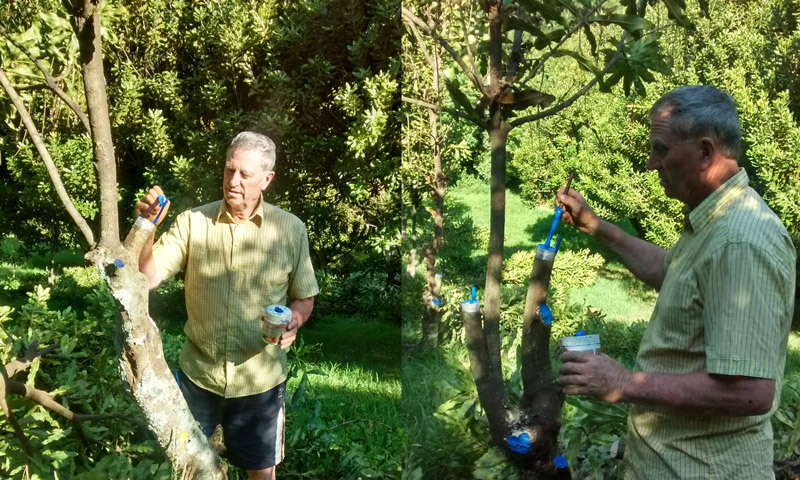 Hands-on training, use of grafting tools & equipment, practice & ‘real’ graft-wood, rows of trees for top-grafting. What’s involved on the day? 10.00am – 12.00pm Introduction to and preparation of grafting equipment and practice preparing scion wood. 12.00pm – 1.00pm Lunch (BYO), drinks supplied; view existing top grafted trees and rows allocated for top-grafting. 1.00pm – 3.00pm Prepare trees for top-grafting, prepare and apply ‘real’ scion wood, complete taping and waxing; photo’s of individuals grafting work. 3.00pm Review results and share feedback over afternoon tea. Who do I contact to attend? To attend please fill in the form below, or get in touch with Vanessa by phone or txt on 0274 687588. If you have confirmed attendance but can’t make it, please phone or txt Vanessa to let her know. When you've entered the required fields, please click the "I'm not a robot" box to help us prevent spam, then click Send. You will receive a confirmation email when your request has been successfully sent.